Day 224: Pay It Forward . . .
Pay It Forward . . . remember the movie? Joel Haley Osment, Kevin Spacey, Helen Hunt? We’ve actually talked about this movie before, but it’s really powerful in a day and age that seems to exist only in the ‘here and now’ and NOT in the future. What happened to one generation looking out for the next? What happened to investing today for a better tomorrow? What happened to paying it forward? We aren’t sure. But, we pretty sure it’s becoming a ‘thing of the past’. You know – the past . . . when people did what was RIGHT. When people did what was good for future generations. Today . . . all we seem to hear about is two ends of the spectrum . . . “spend, spend, spend–without expecting results OR don’t spend, don’t pay, don’t do anything to upset MY applecart. . .forget about tomorrow, I’m only interested in me.” The former is bad enough . . . spend yourself into oblivion and you’ve got nothing to show for it, but the latter is particularly disconcerting. As boomers, we grew up with a generation of parents and grandparents who were ‘paying it forward’ on everything from water, roads, schools and everything in between. Sure, the cost of doing business ‘back in the day’ was less than it is today, and back then, debt wasn’t an all-consuming issue like it is today. BUT, they still made it happen – as a product of the 60’s and 70’s, we saw first hand the buildings, the bridges, the roads, the schools, the communities – all built on a concept of paying it forward. You know, paying today for something better down the road. Sad to say – it’s a lost art in 2013. That is until the past couple of nights that have taken us to a couple of Catholic school Galas . . . classic fund raising events designed to ‘motivate the troops’ while at the same time pay some bills. Nothing moves a person to open a wallet faster than a young man or woman who has benefited from the gift of education, and so the last couple of nights we’ve watched people step up to the plate to ‘pay it forward’ for the next generation of students attending Catholic schools. Now, please understand, we don’t have anything against public education – in fact, both of us are products of the public high school system in Texas, so we’re talking about parents who are looking for spiritual development, discipline, character development and college preparatory curriculum. Watching people pay for something so intangible as an education for a young man or woman they’ll never know is the stuff that brings tears to your eyes. Paying It Forward – it’s as fresh and welcome today as it was when our parents and grandparents paid it forward for us . . . so where did the train fall off the tracks??? Who knows!! So tonight, after watching people step up to help out one of the schools in the Diocese of Austin, we settled in at the AT & T Executive Center in Austin and enjoyed a 2004 Tahuan Syrah from Ernesto Catena in Mendoza, Argentina. At less than $15 a bottle, this is a special wine – assuming you can still find it because the good folks at the AT & T Center were pretty adamant about saying they’ve bought the remaining bottles of this vintage, and for the price point — a little higher at the retail level . . . you’d be hard-pressed to find a better wine. The Syrah may have been the biggest surprise, however. 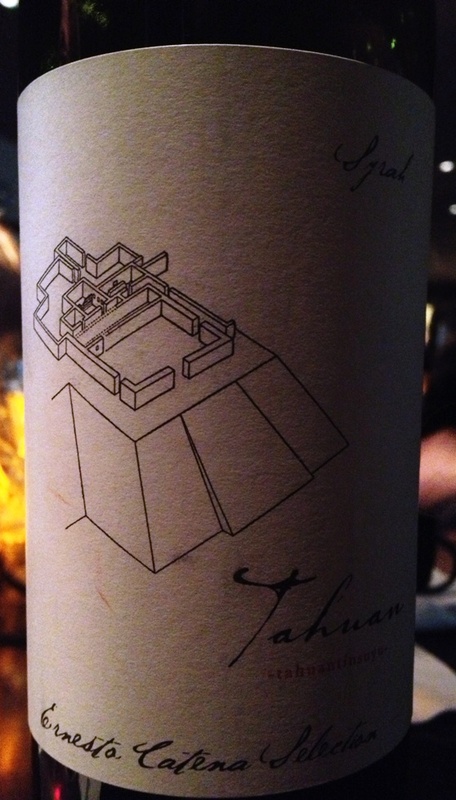 Mendoza is known for Malbec and Cab, maybe, but not Syrah. Intensely aromatic with camphor, dried herbs and bacon, (if it’s bacon, it’s got to be good!) this is a stunner from the get-go. Add that to the perfectly ripe cherry, dried lavender, lamb jus and white pepper here and you have a syrah that will stand up to wines at least twice its price. . .yeah, it’s THAT good. Clearly, there are better wines out there for more money, but for the price paid, and the flavor enjoyed, you’d have a difficult time finding a wine this good from Argentina, that’s 9 years old and under $15 a bottle. It’s good stuff!!! Whether or not you have youngsters that attend public schools, private schools, parochial schools, you have the responsibility of making sure THEY get the best education possible. AND, if somewhere along the way, you’re asked to help pay for something new here or there . . . think LONG and HARD about what you have right now AND – would you have that if someone hadn’t come BEFORE you and paved the way? C’mon folks, paying it forward is easy – – and it’s a great way to tell your grand children that YOU had a hand in making something happen —- WAY BACK in 2013!